I posted this photograph of the MS Riverdance a couple of years back, but seeing the recent posts on Geotopoi of the wreck of the MV Carrier brought back a few memories. 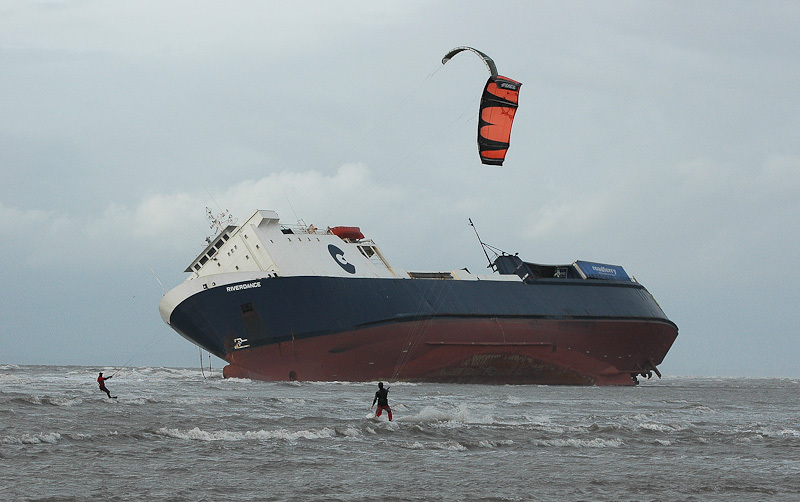 The story is well documented – storm force winds hit Britain at the end of January 2008, and overnight, the cargo ferry Riverdance was hit by a huge wave while trying to make it to the Lancashire port of Heysham. This cause the cargo to shift and the ship started to list at 60 degrees. Mayday was called, and the crew and passengers were airlifted off, before the ship ran aground on the beach at Cleveleys. 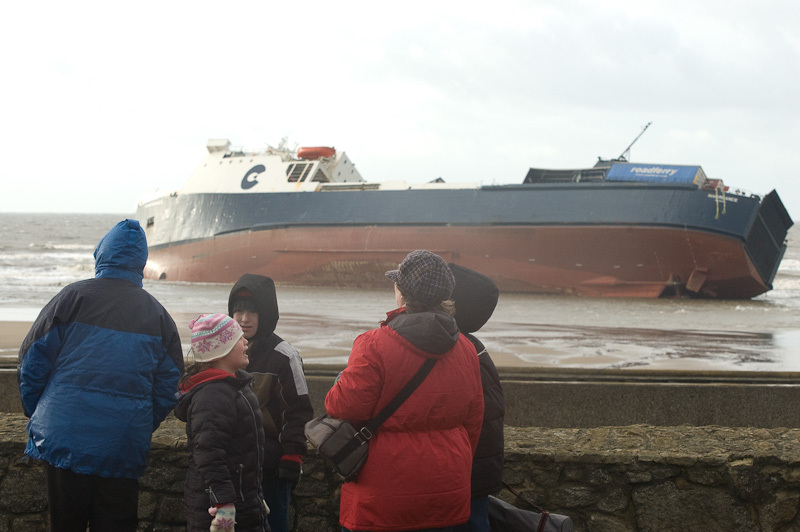 The next day, residents awoke to see this huge ship lying on the beach, just off the prom, and pictures of it were all over the news channels. The weather the following day remained wet and very windy, but overnight, it had become something of a tourist attraction. I’d just returned from a holiday in sunny Australia, but despite being severely jetlagged, I decided that this wasn’t the kind of thing that happens everyday round these parts, so I made the short trip up to Cleveleys to see what was going on. The town centre somewhat overrun with cars, but I’d already got a photo in mind looking back down the coast towards neighbouring Blackpool, so I headed north for some easier parking and set off down the beach in the face of a strong, bitterly cold wind throwing rain and hail at me off the Irish Sea. This being the first day of February, the light was very low in the sky and somewhat weak, and as I headed southwards down the beach into the sun, the light seemed to be constantly changing as the strong winds continued to blow dark clouds across the sky. Seeing the ship lying on the beach at a jaunty angle was a strange sight. It’s hard to articulate why – maybe it’s because your typical image of a shipwreck is one you’d see on TV news of a ship at the bottom of a steep cliff being smashed apart by the waves, or of a ship taking in water at sea. But to see a completely intact ship on a flat beach, a few hundred yards from houses and shops, with lean so severe that it’s cargo of articulated lorries were falling into the sea, was somewhat surreal. Part of the reason I’d headed north from the wreck was because the photo I had in mind was inspired by a great photo on the BBC news websites ‘Big Picture’ feature., and I wanted to capture something similar. Using the telephoto, I was able to achieve exactly the composition I had in mind, although I had to get the positioning just right so that I could get a recognisable Blackpool Tower in to give the picture some context. Without it, well it could have been anywhere really couldn’t it? But I suppose that’s the art of the photojournalist, to tell a story in one picture. Having a picture in mind was one thing, but the execution of it was another matter, thankfully, I was using a 70-300 VR lens that I’d just picked up in Hong Kong, en route to Australia, and the stabilisation was a real boon when using the lens at 300mm in a strong wind with what felt like frostbite eating my gloved hands. With my main planned shot in the can, I started to see what other opportunities presented themselves. Getting close to the ship wasn’t going to happen as the Coast Guard were actively enforcing a 400 metre exclusion zone, so I was forced to look from afar. Just then, a yellow Sea King clattered into view and made it’s way to the ship. 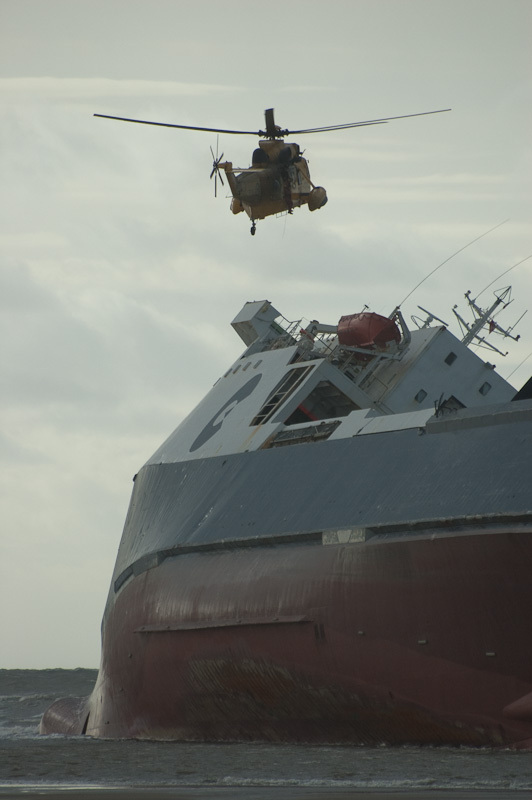 Hovering above the superstructure, the winch descended and lowered a man onto the precariously angled deck. On board must have been like a 1960’s Adam West era episode of Batman, and he didn’t appear to hang around for very long, before ascending back into the Sea King. As I got closer I began to realise just hoe many people had turned out to gawp at the spectacle. 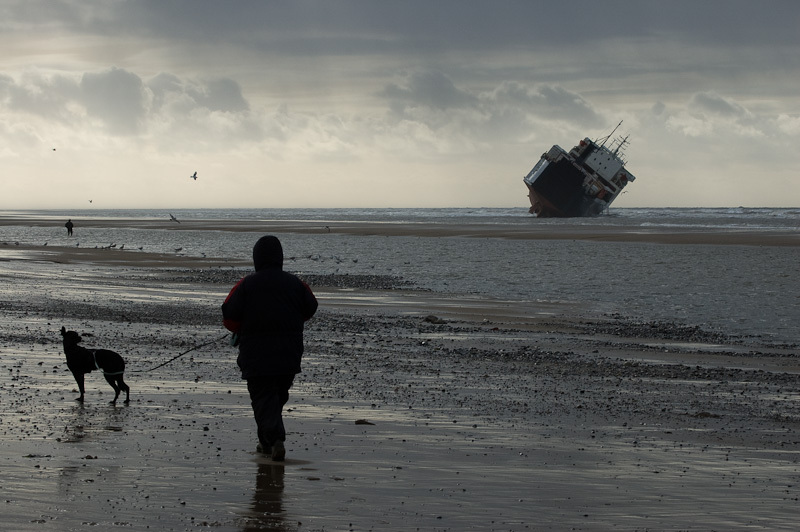 Like a giant steel beached whale, the ship became a magnet for thousands of people. And not just from the shore. 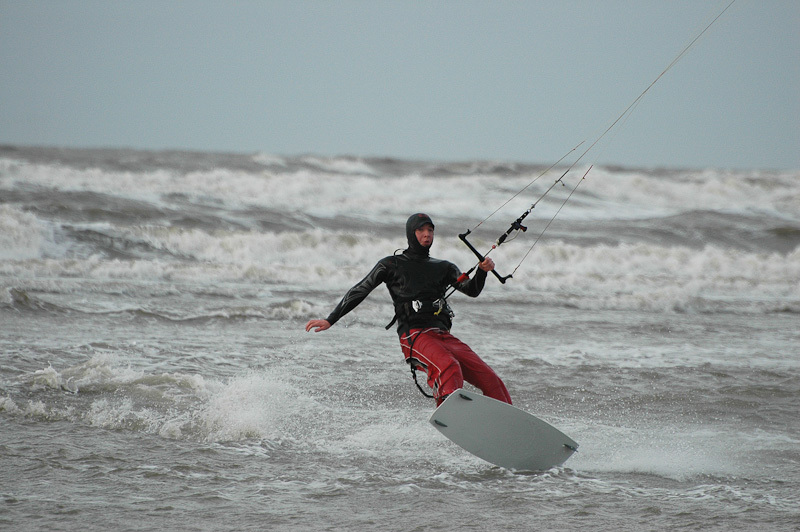 Ignoring the exclusion zone, the local kite surfers took advantage of the strong winds to get some spectacular height on their jumps, much to the frustration of the Coast Guard who couldn’t do much about them as they had no access to boats. Walking back along the beach close to the sea wall, I noticed something that I’d missed on the way down the beach – millions of chocolate biscuits! I neglected to get a photo unfortunately, but amongst the shingle and flotsam and jetsam washed ashore in the storm were piles of soggy chocolate digestives that had previously been in one of the storm damaged artics on the deck of the ship. I didn’t salvage any as I’m not a fan of pre-dunked biscuits with my brew! What became of the ship? After several attempts to refloat it failed, it was declared a total loss. I suspect this was partially due to its age, as it looked substantially intact, however, I’ve also read somewhere that a ships structure will weaken after a prolonged period of time aground at an angle. This is because the forces acting on it are different to what it was designed for, and so stresses are caused which could be terminal. So the decision was taken to break up the ship where she laid. This was no small task as clearly the beach is subject to the tides and whatever weather the Irish sea could throw at it. And with gravity eventually kicking in, the ship toppled onto its side which I would imagine isn’t the optimum position for shipbreaking. Demolition was eventually completed in October 2010, and I’ll try to dig out a few images I took on later visits. Since 2008 there have been no more shipwrecks on the Fylde, indeed, there were only actually three in the 20th century. Whether this is due to advances in navigation technology, improvements in the seaworthiness of ships, or a decline in coastal traffic I don’t know, but that wild night in January will stick in local memories for years to come.